My Son Kaizer is wearing the costume he is 12 years old. He plays the video game arkham asylum and asked to be the Joker this year but that he wanted a dapper classic Joker look like the one from the video game. He wanted to look polish and comic book like. 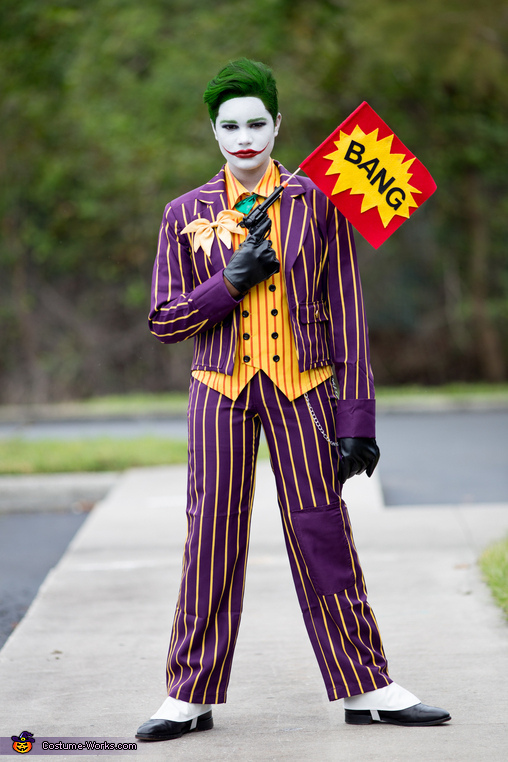 We ended up creating the bang prop gun ourselves handmade to really intensify the comic relief effect, The costume was bought from a cosplay maker who creates costumes, The shoes were trifted and the shoe covers where bought from marching band shop. The hair and Makeup was done by me (Mom) using Ben Nye Professional Makeup and we combed and spray his hair green.